It's been a long time since ST owners were treated to a true coin-op conversion. Does Arkanoid fit that bill? Inside the Arkanoid package, you will find a comic-book-style mission briefing. Arkanoid, like most other pure arcade games, certainly does not need historical/philosophical justification for addictive play. It's just thrown in for laughs. It seems that you are in charge of the spaceship Arkanoid that has blasted away from Earth with the last survivors of civilization. The ship encounters a grid wall of dense, undulating energy. Suddenly, this energy materializes into a living force-field creature that blocks your path. It is impossible to turn back. Your only hope is to take a handful of your crew and elude the grid monster in the Vaus escape module. That's about it! What this has to do with Arkanoid, the game, I'll never know! What I do know is this: Arkanoid is exactly what they say it is: one of the most addictive video games ever. The first time I saw Arkanoid in my local video-game emporium, I was not impressed. "Who needs another Breakout clone?" said I. While Arkanoid resembles Breakout, it is surely not a clone. Yes, you must control a paddle, the "Vaus," maneuvering an energy ball in order to break down walls of bricks, but there are many more twists that make this game fun and highly addictive. One of the variations is the bricks themselves. Silver bricks will require more than one hit to disintegrate. Gold bricks are indestructible. Then, there are the ever present Konerds, Pyradoks and Tri-Spheres that appear on the play-field. At first glance, these appear harmless. But they can cause you trouble if you don't watch out. These animated sprites move toward the Vaus in their own attack patterns. They can be destroyed very easily, by contact with the Vaus or by being hit with the energy ball. They can also change the course of the energy ball, when they are hit. This is where caution must be utilized. If you hit one of these baddies toward the bottom of the screen, you may have the ball returned where you cannot reach it. And finally, there are the capsules that are randomly released when the bricks are destroyed. Each are labelled with a letter related to the function of the capsule. Catch one, and it imparts its unique power to the Vaus. "B" (break) opens a door at the lower right-hand corner of the play screen. Moving through the door advances the player to the next level. "C" (catch) turns the surface of the Vaus sticky, so that the energy ball can be caught in mid-flight. This enables a player to take a breath, while he decides where to fire the energy ball again. "D" (divide) splits the energy ball into three clones. This is useful when it has gone behind a wall. It can be disastrous if it happens in front of a wall, because in the heat of trying to catch up, you can make the wrong decision and wind up losing all three. "E" expands the Vaus to twice normal size, which makes it easier to hit the energy ball. "L" arms your Vaus with twin lasers that are fired with either mouse button; a highly prized capsule, when faced with many silver blocks. "P" (power) awards the player with an extra Vaus. Lastly, "S" temporarily slows down the speed of the energy ball. Only one capsule's power can be retained. Once another is taken, the original power is lost. The real treat here is the decision that the player must make during the heat of combat. "To take a capsule, or to not take a capsule; that is the question!" Frequently, you will find the energy ball and a capsule in the same area of the screen. If you go for the capsule, you could lose the energy ball, and vice versa. Probably, you will try for both, and come up empty-handed, while losing a Vaus to boot. Several home versions of Arkanoid are accompanied by a custom paddle controller, that mimics a track ball. The ST already comes with a very decent substitute, the mouse. It is especially nice when used in conjunction with a mouse pad. The movement of the Vaus is smooth and responsive. 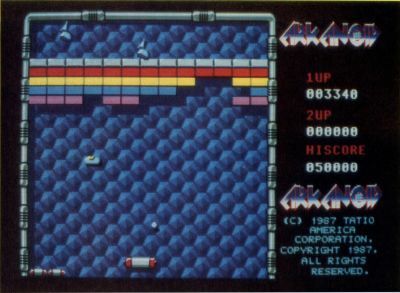 Arkanoid presents all of the 33 screens of the original arcade game. No codes are provided, however, that will allow the player to enter a higher level later on. You must always begin at screen No. 1. Now, to answer the question I proposed earlier. Yes! Arkanoid is an excellent conversion of the coin-op original. The graphics are crisp and colorful. The animation is smooth and fast. The soundtrack is raucous and provides a real arcade atmosphere. The sound effects during the game are very realistic. On the downside, the high-scores cannot be saved to disk, but since the disk is copy protected, this missing feature actually protects the disk from damage. I discovered a bug in the high score routine, anyway. After playing for awhile, I amassed a score of KK4000, and this score replaced the high score of 50,000. After that, I consistently scored more than 4,000, but did not get a chance to enter my initials on the high-score screen. But this small bug and the lack of an on-disk high-score feature are minor quibbles. All things considered, Taito gets a B+ for its efforts!